After picking up ATV permits at the Shell station along Highway 6 (near milepost 42), and a few whacks on Big Red to free up a recalcitrant parking brake, we fly straight past Rogers Camp trailhead on the way to South Fork Road (just past milepost 28, on the left). We’d planned to do a route we’d done many times before: head up South Fork Road (through Lyda camp) to the Hoodraiser and nearby Hogs Back trails, follow C-Line Road southeast near the south boundary of the park to Firebreak Five, and then run Cedar Tree top to bottom (and north) on the way out to Rogers Camp and Highway 6. Hoodraiser is a nostalgic favorite. 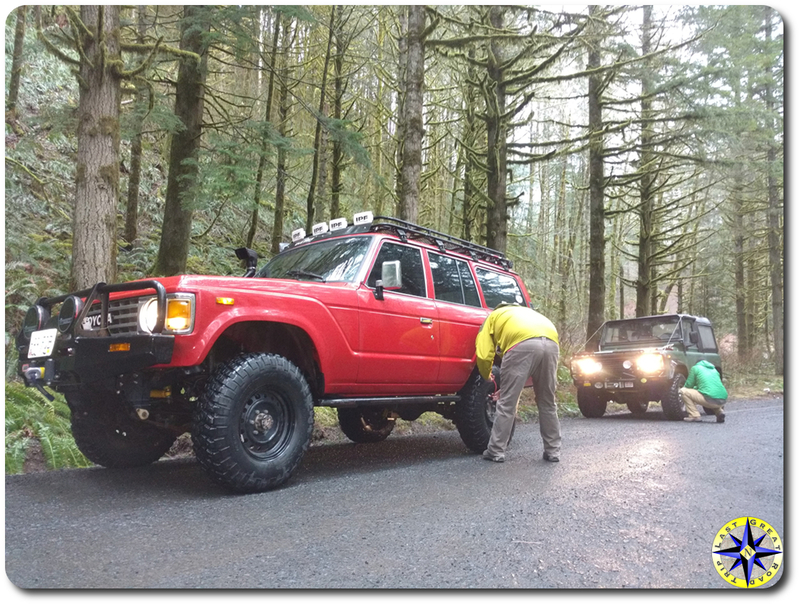 Chris and I cut our wheeling teeth with the Northwest FJ Cruiser Club, which had adopted Hoodraiser when we were members. (And had FJ Cruisers. The FJ Cruiser has proven itself a notoriously effective gateway drug. Eric, take note.) With our friends in the NWFJCC, we’d spent many many happy hours maintaining the trail. Hoodraiser is an easy drive with few turns, traversing up and over many swail berms, hence the trail’s name. On the second half of this warm-up trail, the snow depth steadily increases as we climb, until at last there are no recent tracks. On one of the last climbs, Big Red scoots up nicely, but I lose momentum and come to an inopportune stop midway in the climb. The loose, wet snow on top gives way to ice on a couple of quick tries to right matters. It’s early in the day, and the path of least resistance is to back down, turn around, and carry on. Carrying on (according to plan) involves following South Fork Road uphill, parallel with Hoodraiser. With (now) expected results. We are prepared for this, but after a good stretch of additional rain and warmer temperatures, none of us really expected the amount of snow remaining. (NOAA weather reporting on local snow levels was also off; it would be snowing down to about 1500′ all day, whereas the reported snow level had been 2500-3000′.) 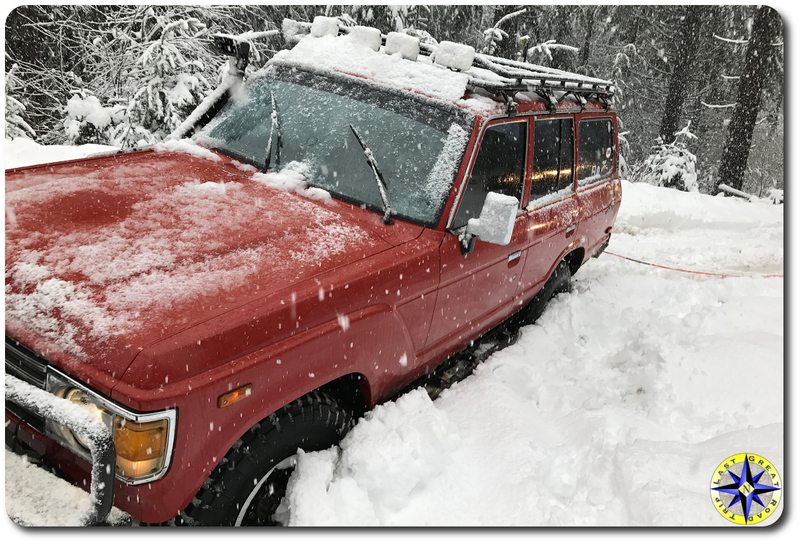 On reaching the intersection of South Fork and C-Line (Hoodraiser exits at the top on C-Line), we’re in axle deep, or deeper, snow. Over the years, Chris has displayed an impressive ability to throw his vehicles into snow with innocent abandon. And true to form, Big Red is soon — wait for it — stuck. 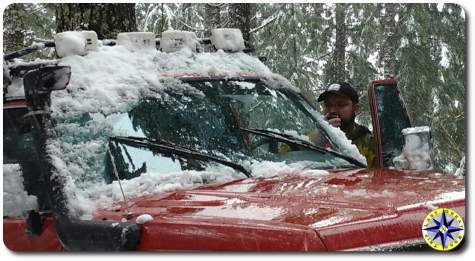 A quick pull later, we proceed to saw and crawl the rigs to a nearby bare spot under some some tree cover. Decision time take two. Air and chain up for the several miles drive along C-Line to get to our chosen next destination (Firebreak Five or Cedar Tree)? Or head back down South Fork to Highway 6 and head to the trails from Rogers Camp? Once again, we opt in favor of an earlier arrival at the (next) trails and limp back east on Highway 6 to the Rogers Camp exit. The forest has been eerily quiet this Sunday. So far we’ve seen just a trio motorcycles in and around Hoodraiser; we’ll see just a couple trucks along Cedar Tree, running in the opposite direction. The number of trailers parked at Rogers Camp trail head also seems surprisingly light for this holiday weekend. Our attempt to reach our destination from the east is rewarded. 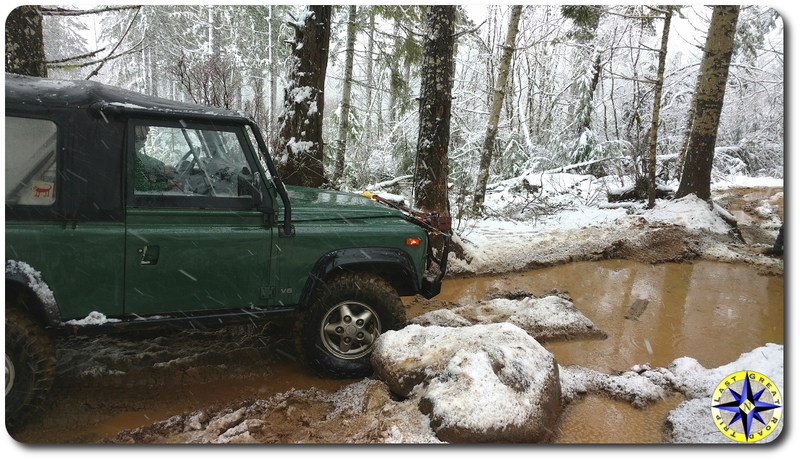 Though the snow gets deeper as we climb, we’re easily able to get to Saddle Mountain Road and to the top of Cedar Tree. 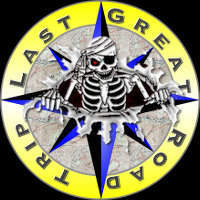 Trail ho! Turning in, we can see some recent tracks through the top of the trail. But Cedar Tree — named for the signature fallen cedar on a lower section under which many (but by no means all) rigs can pass — has a pretty dense canopy, so there’s not a ton of snow on it in any case. 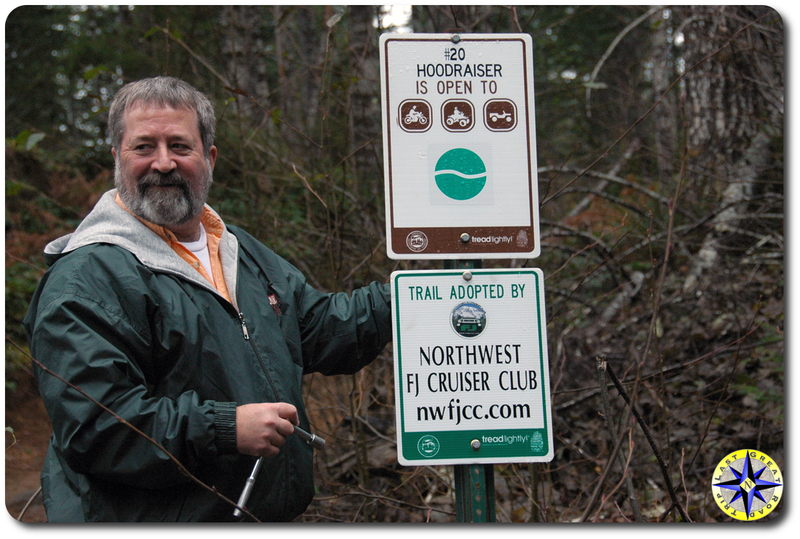 This is simply a great Pacific Northwest trail, twisting and turning up and down through the trees and vegetation. There’s not a lot of tricky stuff here, just enough to keep you sharp and provide opportunities for dusting cobwebs off basic skills such as seeing the trail over the hood, good tire placement (and general line picking), and left-foot braking. All in all, this is one delightful drive through the forest. The biggest challenge today comes along a bottom section, with a tight squeeze between some rocks and an inopportunely-placed tree. You know the sort of thing: impending carnage from a downhill-side tree pushes you towards the rocks, while crawling the rocks on the uphill side tips the truck and its external bits into the tree. Rock. Hard place. Through use, perhaps helped along by the recent spate of wet weather, these particular rocks have become much more dug out — certainly more than we can recall in about ten years of running Cedar Tree. So much so that some very recent, “creative” attempts to avoid the obstacle have widened the trail by cutting an undesignated bypass on the uphill side. It’s hard to know whether to attribute this to ignorance or disregard. But the governing principle here is pretty clear: if you’re unable or unwilling to stay on the trail through an obstacle, carefully turn back. Put another way, if there’s no designated bypass, don’t make one. Far from an exercise in ego-boosting, this is a simple matter of protecting trails so that we all can continue to enjoy them. Tread Lightly out there, kids! Sizing things up, we make it over the obstacle relatively unscathed — the stock rear bumper assembly on a NAS Defender 90 enjoys asserting itself — with some light spotting and complete this delightful trail. By now it’s about 3:00PM and I have a good several hours ahead of me to make it back home north of Seattle. And so it’s back to the trailhead to air up, check things out, and head out. Any day wheeling…. 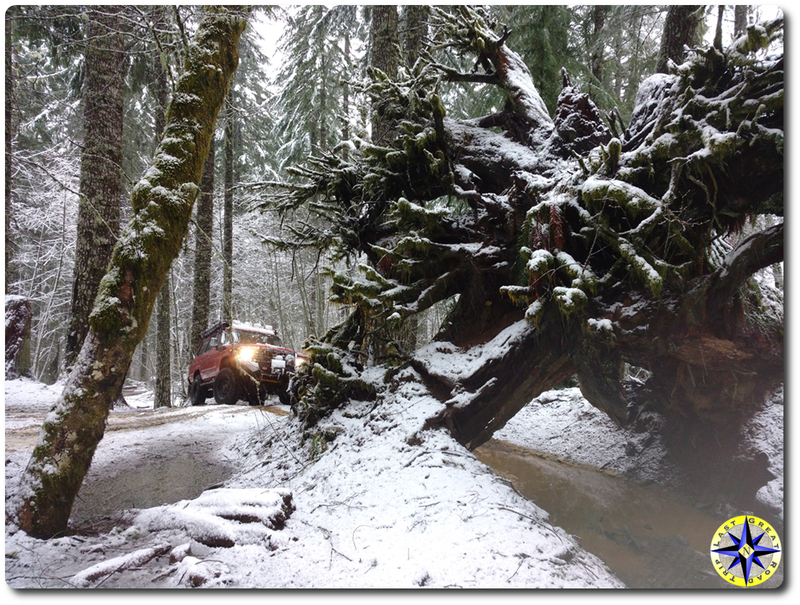 If you don’t already know, the OHV areas in Tillamook State Forest comprise a most excellent off-road trail system, with (according to the 2014 guide and map) more than 250 miles of OHV trails at all skill levels, for everything from motorcycles through four-wheel drive buggies. 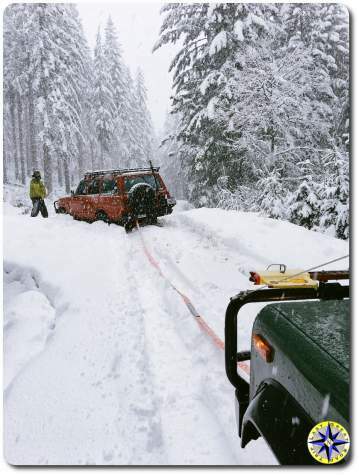 Managed by the Oregon Department of Forestry (ODF), TSF OHV areas also include multiple campgrounds and trailheads to help make the stay even more enjoyable. As with OHV areas elsewhere in Oregon, the ODF actively partners with clubs and other volunteers for trail maintenance and more should you and/or your club want to become involved as stewards of this considerable resource. In addition to being a multiple-use facility, TSF is also a working forest. So while roads and trails are generally well marked, junctions might come and go.